Preston Laing Productions - 87 min. Cast: Healther Bolton, David Letch, Perry Piercy, Suzanne Lee, Margaret Umbers, Danny Mulherron, Gary Stalker, Kate Harcourt. Screenplay: Gaylene Preston, Geoff Murphy, Graeme Tetly (based on a story by Elizabeth Jane Howard); Photography: Thom Burstyn; Music: Jonathan Crayford; Editor: Simon Reece; Producer: Robin Laing; Director: Gaylene Preston. 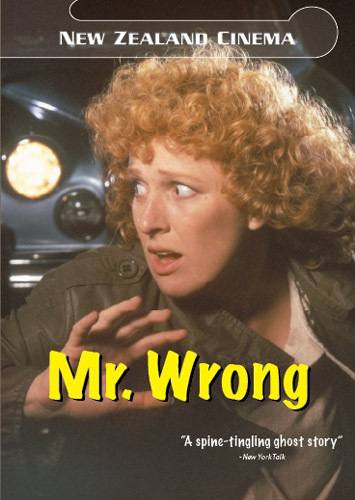 Meg(Heather Bolton) moves to Wellington and buys a used Mark II Jaguar, only to discover it is haunted by the previous owner - a woman murdered a few years earlier. Along with the ghost comes the murderer who stalks Meg, intent on adding to his previous deed. This was the first New Zealand film made by a female producer/director team. An excellent low cost production that one reviewer commented, "What Stephen King's CHRISTINE should have been". Recommended. Expect used NTSC vhs copies to be less than $10us. Used PAL copies are hard to find and will probably be at least 10# or $20nz. As of July 2009, a new R0 PAL DVD is available from NZ sources for under $15nz and is presented in its original 1.33:1 format with 2.0 stereo sound. No extras. 1986 - Mystfest, Italy - Commendation to Actress Heather Bolton. 1986 - New Zealand Film Awards - Best Actress: Heather Bolton.